I am doing a training next week for a number of different businesses on Shareworthy Customer Service (with Tim Miles who deserves credit for coining the term Shareworthy). I have been doing a little research on each of these businesses to make sure that what I teach will fit for each business because when it comes to Customer Service, one size does not fit all. Too many of the books I have read on Customer Service focus on teaching your staff a simple, repeatable system. 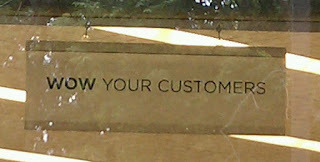 Their system, they write, is the one and only way to offer great customer service (sarcasm fully intended). There isn't a one and only way. Heck, for each business there are a handful of different ways to offer memorable and shareworthy customer service. Don't get me wrong. There are founding principles behind Shareworthy Customer Service. There are characteristics that are similar for all businesses. But the systems each company must implement have to be unique and flexible to truly be shareworthy. Focusing only on the system, not the reason behind the system, guarantees that your company will meet the letter of the law, while never grasping the spirit and never really being shareworthy. For instance, we all know that it is important to greet customers when they walk through the door. The other day I entered a Rite-Aid store and heard a voice cry out "Hello! Welcome to Rite-Aid." I looked around and saw no one. There was a stack of boxes a couple aisles over. I heard some rustling behind the boxes. Sure enough, a young gal was down on her hands and knees stocking the shelves. She heard the automatic doors open, assumed someone was walking through, and because she was trained to greet every customer, yelled out her greeting over the stack of boxes. She thought she was giving great customer service because she was doing what the system told her to do. I don't blame her. But here I am - with you nodding in agreement - telling her tale as an example of far less than shareworthy customer service. Now, if she was taught that it was important for customers to be greeted so that they actually felt welcome, that they felt important, that they felt like you were there to serve them, then she might have stood up, looked me in the eye, welcomed me, see if I needed any direct assistance, and explained that she was available and could be interrupted if necessary. Nope, instead she was taught a system - greet every customer. Shareworthy Customer Service should be the goal for every independent retailer. But before you simply put a system in place, make sure you know why the system is there and what the goal is for each step. Then make sure you build some flexibility in so that when the system fails the goal, you can momentarily change the system. PS There are still a few seats available for next week's class. Come to Austin, Texas. Tim and I will teach you the foundation for SCS and how to implement systems that make sense for your business. Soon they will be writing books about your legendary customer service, too.